This is route that is designed along the local paths and mule trails to showcase a different part of the area. It is a nice option for people keen on learning about the region’s geography, history and culture. The incredible view over the snow-capped peaks from the passes is punctuated by village walks observing the daily rural activities. Juniper vegetation, pine trees and oak trees interspersed with red villages due to using red clay as a building material are the highlights of this hike. 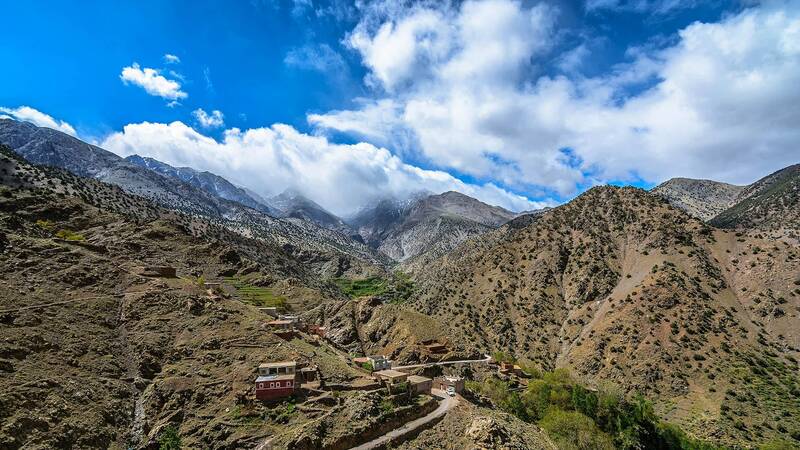 We depart from Marrakech for a pleasant drive south, winding our way up through the Moulay Brahim Gorge and upper valleys to arrive at the higher foothills of the western High Atlas Mountains. At our trailhead of Imi Oughlad within the close proximity of Jbel Toubkal National Park we alight from our vehicle and meet up with muleteer crew. We set off up in a north-westerly direction for a 2 hour acclimatization hike passing by cornfields, pine and juniper woods to the Tizi n’Tachte. There we can stop to look back down on the valley of Imlil before carrying on for another half hour to Imi n’Lfri and our wild picnic. After our lunch and a rest, we take a slow hike for about 2 and half hours south-west down along a dirt track to Assif n'Ouissadene and the red clay terraced village of Tiziane. After breakfast we set off on our hike up along the Assif n'Ouissadene Valley passing through the walnuts groves up to Tizi n'Taghrhourte (1995m). We continue through a rare, almost flat stretch to arrive at Assaka spring where we will stop for our wild picnic amidst the silence nature provides. After some 2 and half hours relatively easy walking, our afternoon's hike takes us down along the edges of the forest until we reach the Berber Village of D'knt (1870m) or Agounss n´Assoul where we will have our dinner and spent the in a bivouac or gite depending on the season. We set off in the morning for our 3 hours hike up through groves of walnut trees, fields of corn and barley to greet the many men and women sheep and goat herders. We traverse the Tizi n'Tagdalte to descend among the juniper trees until we come to a small spring set amongst the trees where we will stop for our picnic. Once refreshed, we are off down winding tracks of upper slopes for some 3 hours to come to a small river at the beginning of the valley of Assif n'Ouissadene. From here we enter the village of Tizi Oussem (1850m) and then up to the summer village of Tamsoult for our camp or gite. Today involves a fantastic climb out of the Azzadene Valley. You'll head up the valley towards the summer village of Azib Tamsoult from where you'll trek up to Ighouliden Waterfalls prior to trekking back over the pass at Tizi n´Mzik (2489m) for lunch. After a delicious lunch prepared by our team, we will be descending down into Imlil to spend the night in our place or you can chose to take transport down to Marrakech. Approximately 5 to 6 hours of walking.